The FBI is investigating Chinese telecoms equipment-maker ZTE over allegations it sold banned US computer gear to Iran, according to a report. An investigation by Reuters in March alleged that ZTE had provided products made by the likes of Microsoft and HP. In documents obtained by the Smoking Gun website , a ZTE lawyer said company officials also discussed shredding material relating to the alleged deals. US sanctions prohibit the trade of any non-humanitarian goods with Iran. Reuters said that ZTE had sold Iran a surveillance system capable of monitoring landline, mobile and internet communications. After the report's publication, ZTE said it would curtail its business with Iran. Ashley Kyle Yablon, the general counsel of ZTE's US subsidiary in Texas, made the comments during interviews with FBI agents. Mr Yablon said ZTE senior managers discussed several measures to subvert the investigation into the deal by the US Department of Commerce. He said he had also seen a "packing list" - a document detailing items in a delivery, including hardware made by top US companies such as Oracle, Cisco and Dell, worth in the region of $120m (£80m). In the original Reuters report, the equipment was described by an unnamed former telecommunications project manager in Iran as being "far more capable of monitoring citizens than I have seen in other equipment". Mr Yablon said he had seen an Iranian contract which outlined "how ZTE would evade the US embargo and obtain the US-manufactured components specified in the contract for delivery". Mr Yablon told FBI agents that the Shenzhen-based firm "was concerned about how the Reuters reporter obtained a copy of the packing list... because it could no longer 'hide anything'". 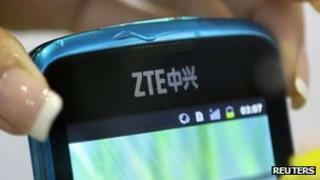 ZTE, the world's fourth-largest mobile device maker, has declined to comment. On Friday it warned that its first-half profits could be down by as much as 80%. The company blamed lower gross margins, foreign currency exchange losses and domestic operator networks postponing their tenders. The investigation will fan the flames of what is seen by many as a growing dispute about the proliferation of Chinese electronics companies across the world. The European Union is investigating whether China illegally subsidised several of its telecommunications companies - including ZTE - to enable them to grow quickly and overtake the likes of Nokia and Alcatel. At a recent meeting to discuss the matter, Beijing warned that if Brussels pressed ahead with its investigation, there would be severe retaliation against other western industries such as motoring and agriculture. The Financial Times quoted a source familiar with the events as saying: "Put it this way: it's not like they went for a beer after and watched football." The west's concern over China's emerging telecommunication giants extends beyond worries about increased competition. Huawei, the world's second largest telecoms manufacturer, has faced allegations that its use poses a security threat, with attempts to expand its operations in the US blocked due to supposed close ties with the Chinese government and fears about possible surveillance possibilities. In Australia, the government cited similar security concerns as it barred Huawei from placing a bid to provide very high-speed broadband to almost every home in the country. In response, Huawei has said it complies with all local and international laws, and welcomed any investigation into its practices. The company said accusations of how its technology could be used to track and censor communications were "inaccurate" and "groundless".